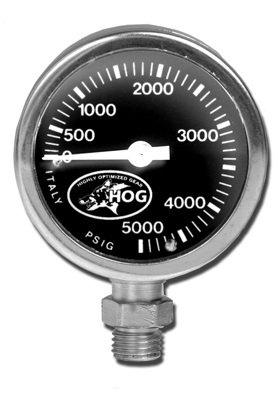 The HOG SPG is a robust and simple pressure gauge designed for ease of use and reading. The casing is chrome plated plated marine grade brass fitted with a tempered glass face that is o-ring sealed. The chrome plating allows the gauge to be used in both salt and fresh water and resists corrosion . Face is 2" across the face. Perfect for stage bottles, rebreathers and primary gas monitoring.